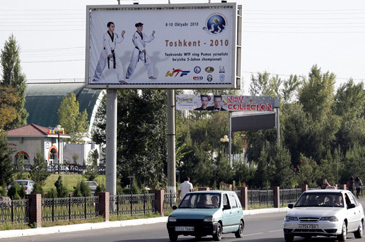 A promotional poster for the 5th WTF World Taekwondo Poomsae Championships shows the upcoming event in Tashkent, Uzbekistan. The three-day event, which will kick off on Oct. 8, is expected to draw about 460 athletes form 58 countries. The Russian city of Vladivostok will host the 6th WTF World Taekwondo Poomsae Championships in 2011. At its extraordinary Council meeting at the Intercontinental Hotel in Tashkent, Uzbekistan on Oct. 6, 2010, the World Taekwondo Federation also selected the host sites for the WTF Continental Taekwondo Qualification Tournament for the 2012 London Olympic Games. The Council granted the Egyptian city of Port Said the right to host the WTF African Taekwondo Qualification Tournament for the 2012 London Olympic Games in November 2011. The WTF Council voted to give the Russian city of Kazan the right to host the European Taekwondo Qualification Tournament for the 2012 London Olympic Games. Mexico City, Mexico won the right to host the Pan American Taekwondo Qualification Tournament for the 2012 London Olympic Games in January 2012 as the United States withdrew its application at the last moment. Bangkok, the capital of Thailand, will host the Asian Taekwondo Qualification Tournament, while New Caledonia earned the right to host the Oceania Taekwondo Qualification Tournament for the 2012 London Olympic Games in September 2011. The WTF Council also approved the proposal for the amendment to the WTF Rules and Regulations, the proposal for the amendment to the WTF Competition Rules and the proposal for the amendment to the Rules on Organization and Operation of International Taekwondo Championships, all of them require the final approval of the WTF General Assembly scheduled for Oct. 7 for implementation. The Council members approved New Caledonia as the WTF’s associate member pending the final approval of the WTF General Assembly on Oct. 7. If approved, New Caledonia will be the WTF’s 192nd member nation. The Council made a final approval on the proposal for the amendment to the Standing Procedures for the Olympic Games. WTF Council members were briefed on the proposed WTF Global Membership System and the WTF Mandatory International Athlete License. They received a report on the 2nd World Youth Taekwondo Camp, jointly organized by the WTF and the Taekwondo Promotion Foundation.